I am not a runner. I actually hate the act of running. Still, I become inspired daily by friends, family, and colleagues who have made positive life changes and seen dramatic results through running and being active. There was a time in my life when I was much more productive in this area. I worked out regularly as a high school cheerleader, rollerbladed through college around Lake Hollingworth at Florida Southern College (yes, that’s what people did in 2003), attended Zumba classes like a champ throughout grad school, and even completed the Tri-Eagle Challenge as a NODA intern at Georgia Southern University. That’s right, I ran 26.2 miles, biked 100 miles, and swam 200 laps over the course of a summer term. When I think back to these experiences, I was never alone in my wellness adventures. I had a cohort of cheerleaders to run with. I had friends to laugh with as we perfected our Zumba dance moves. I even had a throng of SOAR leaders from Georgia Southern who expected to see me at the gym at 6:00 AM for our daily swims, runs, or bike rides. Fearing their disappointment if I missed a workout session made me a regular attendee before and after our exhausting orientation sessions. I am running a 10K in November. I repeat—I am running a 10K in November. I say this not to brag but to make it official. Although I am going to wait to sign up until I can successfully complete a 5K without stopping, I’m committed to attempting and completing this race on November 9, 2013. I’ll be running from Chicago’s Navy Pier, along the Chicago Lakeshore to the Field Museum, and back to the starting line to complete the race. It’s a little over 6 miles. Pitch Perfect. In fact, it’s called Chicago’s Perfect 10 and benefits Gateway to Cancer Research. I’ll gain a medal to proudly display in my office, a long-sleeved hoodie (which is hilarious since all the fun runs I’ve done in Florida came with a t-shirt), and most of all: confidence, accomplishment, and perseverance. I share this with you all because I need accountability. I have a gym in my apartment training so there are no excuses for those rainy (and eventually snowy) days. I have an app that helps me build up my endurance by increasing my running time each time I begin. I have a goal to run three days a week and when this post goes live I will be on week 4 of 8 before I should be able to run a 5K without stopping. Then I’ll have just 4 weeks to achieve the 10K milestone (Realizing that means it’s serious). Sounds easy, but the snooze button has been so much more appealing lately. When I get home from work the last thing I want to do is run (although then I can watch my favorite TV shows on the big screen in front of the treadmills). I am grateful for friends like Kelley McCarthy who text me to ask how my run went, because I feel a greater responsibility. I’m thankful for student affairs professionals like Ann Marie Klotz and Becca Obergefell who inspire me to get out and try running, because they are very public about their attempts, shortcomings, and successes. 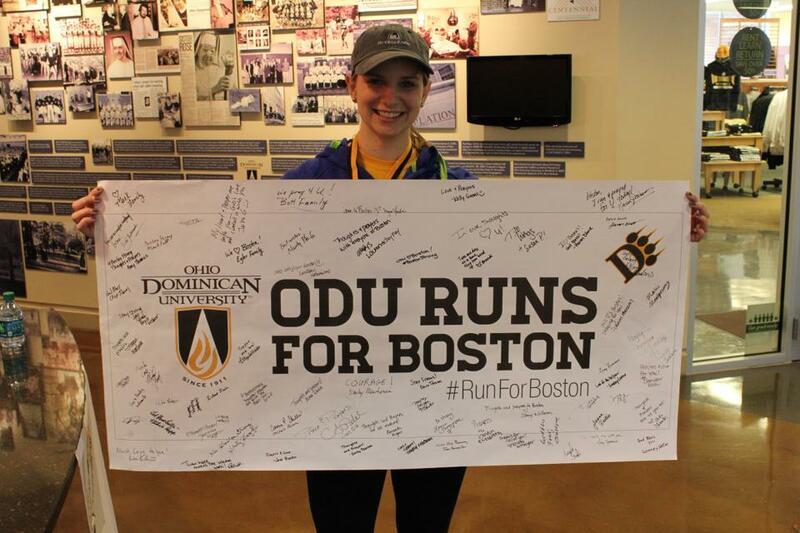 Becca in particular created a following through the hashtag #RunForBoston in the wake of the terrible tragedy at this year’s Boston Marathon. She, like me, did not claim to be a runner herself but was committed to the cause. Last I checked, she’s planning to do her first half marathon! She ran the Disney Princess half marathon in 2013. 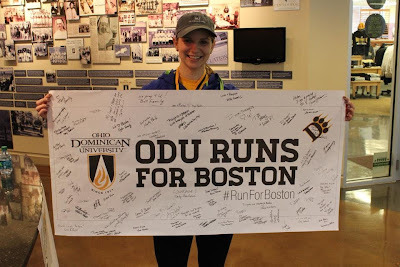 If she, a fellow “non-runner” can run 13.1 miles in less than a year while committing to running the full marathon in 2014, I can certainly tackle 6.2 miles! And my birthday is June 2. Again, it’s nearly perfect. I know it will be difficult. I know how much I love sleeping, eating pizza, cheese, pasta, chocolate, and drinking Coca-Cola. I’ve recently eliminated Coke from my diet but still have a long way to go to get back to my goal weight. I also know that perseverance does not equal perfection. My high school Spanish teacher used to tell us, “Practice makes almost perfect.” So as I prepare for Chicago’s Perfect 10 in November, I need to remind myself that it’s okay to be starting out at a size 10. I can get back to that super 6 or elite 8 if I’m held accountable. And humility goes a long way. Like St. Vincent de Paul reminded us, “He also blesses humble beginnings much more than those accompanied by a lot of show.” And his sweet sister friend St. Louise de Marillac also said, “If humility, simplicity and charity, which produce support, are well established among you, your little Company will be made up of as many saints as there are persons.” Less bragging. More running. Less show. More accountability. Ready, set, go!